Cheese has been made in Britain for thousands of years. Yet the cheeses we know and have come to adore as classically British (Cheddar, Lancashire and Wensleydale, for example) have only in the last couple of hundred years developed into the style we recognise today (for example ‘white’ Wensleydale has only been with us since the 1930s!). But what started Britain’s cheese-making tradition, and why have the styles changed? Britain is renowned for its ‘green and pleasant land’, formed by its fortuitous location on the western edge of Northern Europe. Britain has a moderate temperate climate, a rolling gentle landscape and is well known for … erm… rain. 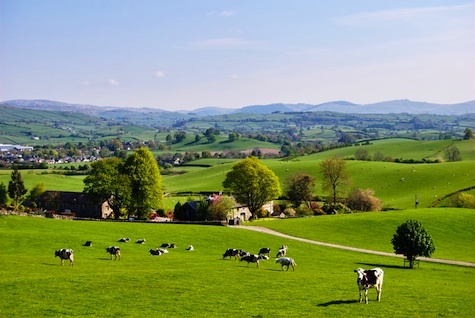 This moderate climate and the generally gentle landscape, devoid of very high mountains and especially rugged terrain, coupled with the year-round supply of rain, enable Britain to nurture some of the best pastures for dairy farming. 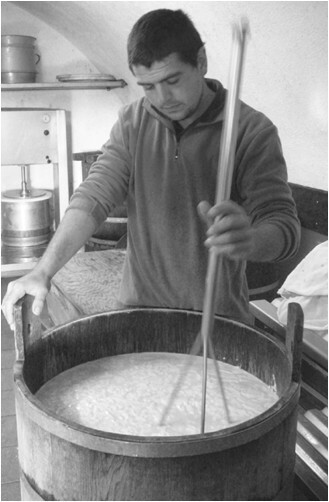 Cheese making came about as method to preserve for as long as possible the abundance of milk produced by dairy farming, without the need for refrigeration. 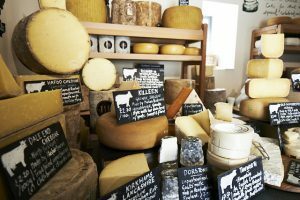 The temperate climate of Britain is ideal for making, storing and ageing cheeses (the thick stone-walled barns and farmhouses in the country maintain a cool temperature all year round, so can be used for ageing cheese). Geographically and climatically, Britain is ideal for producing and maturing cheese, so it’s no surprise that, over time, different cheeses were developed in different areas throughout the UK, inextricably linked to each area’s geography, climate, history and ‘terroir’. One of the reasons France and Italy have traditionally produced more different types of cheeses than Britain is because they have a greater regional variation in geography and climate than Britain. This is particularly evident in France, where the Loire Valley provides ideal conditions for goat cheeses (St. Maure, Crottin, Valencay), northern France’s lush pastures are perfect for soft and bloomy cheeses (Camembert, Brie, Livarot), the high mountain areas require cheeses that will survive the journey to market (Comté, Beaufort), central areas have local bacteria in the air ideal for making blue cheeses (Roquefort, Blue d’Auvergne), and the south, where sheep herding is popular, makes some of the best sheep’s milk cheeses in the world (Ossau Iraty, Brebis). British dairy farming on the other hand tends to be concentrated in the west of the country. Weather systems arrive in Britain most commonly from the west, with the clouds crossing the Irish Sea and bringing plenty of rain. Hence the west of Britain receives much more rain than the east, which means that on the east side of Britain the flatter, drier lands are ideal for arable farming, the middle strip tends to be mixed farming (both arable and dairying), and the west is dominated by dairy production. Britain’s famous cheeses – Cheddar, Gloucester, Lancashire, Wensleydale, Cheshire – all hail from western counties. The rugged hilly landscapes of Wales, Scotland and northern England also favour sheep farming, so cheeses from these areas tend traditionally to be of sheep’s milk. In the lush rolling pastures of the southwest, soft cheeses reflecting the richness would be expected. Today, however, Britain is predominantly known for its hard and blue cheeses, of which it produces some of the finest to be found throughout the world. 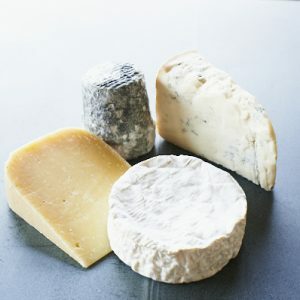 Nevertheless, the dominance of hard and blue cheeses is fairly recent: traditionally a complete range of cheese, including soft and runny, was made throughout Britain. Indeed, cheese-making before the industrial revolution was quite different from that of today.